“It prefers winds that are medium to strong”. 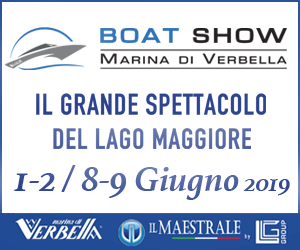 How many times, perhaps during a boat show, have you heard that description being applied to a cruising sailing boat? 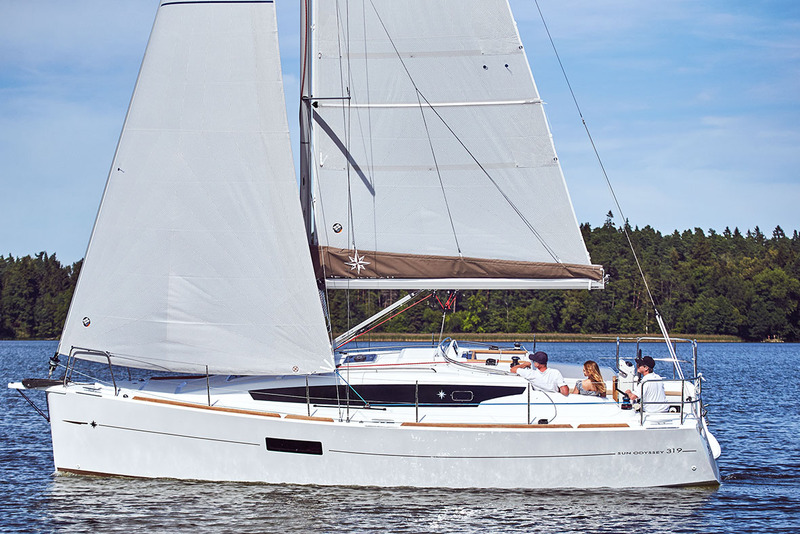 The first thought that came to mind when I was on board Jeanneau’s new thirty-footer was “I wonder how it sails?”. There were five of us on board, all of us fairly large, and – most of all – we didn’t have a Code 0, but just the mainsail and the genoa. It was a performance pack and so with better performing sails, but the Gulf of Cannes had only light breezes in store for us all afternoon. 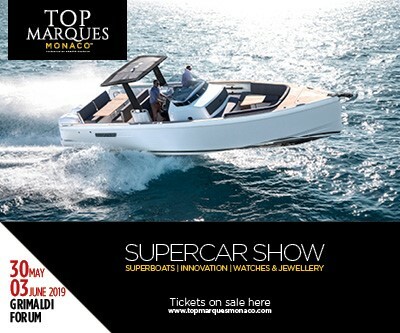 The wind bounced around between seven and eight knots, so not the best conditions for a nine and a half metre boat which weighs over 5,100 kg and has 47.6 square metres of sail. When the wind went over eight knots, the boat managed to exceed four knots, by sailing close hauled and then a close reach. Not that bad, and it is actually acceptable. But it wasn’t so good when we moved away from the coast and the wind fell to seven knots. 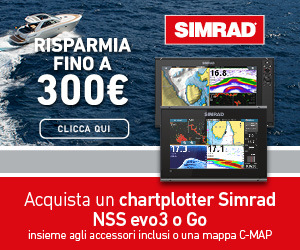 The GPS system actually showed 3.8 knots and there was no way of increasing it. The feeling was also not especially good because it felt more as if we were drifting rather than sailing. 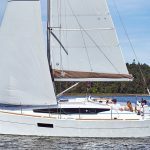 Without much wind the Jeanneau Sun Odyssey 319 didn’t find its way, and had difficulty in getting over waves that were less than half a metre high. I don’t think it only depends on weight. It isn’t light, but neither is it very heavy. So it is more or less similar to other pure cruiser models, or – at the most – a few hundred kilos heavier. The problem is perhaps created by the waterlines which haven’t been designed to yield the best without much wind. 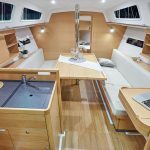 The project was entirely done by Jeanneau and was the product of a partnership with the Polish yard Delphia. 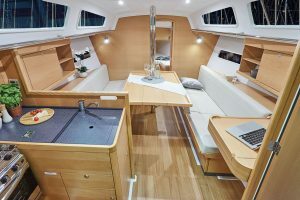 The deck is fitted out in a traditional way, but everything is to hand. There are two winches either side of the cockpit, which are fairly comfortable to reach, even for the helmsman, and two others close to the companionway. There are two rudder blades, in part because the boat is nearly three and a half metres wide, and the greatest width is somewhat shifted towards the stern, so there is enough space for the two rudders. There is, however, only one wheel and it is fixed to a column in the middle of the cockpit. It creates a look which is a bit like that of boats from the 1980s, but we are also on a cruiser and not a regatta boat. It wouldn’t make sense to have a tiller, and there wasn’t a lot of space to have two wheels. The aft part of the central wheel column houses a folding table that can be opened up. There is also a lot of space available in the lockers. The one designed for gas canisters actually holds two of them, and underneath the benches in the cockpit there are two others where you can store ropes, the spare anchor, fenders and a lot more besides. 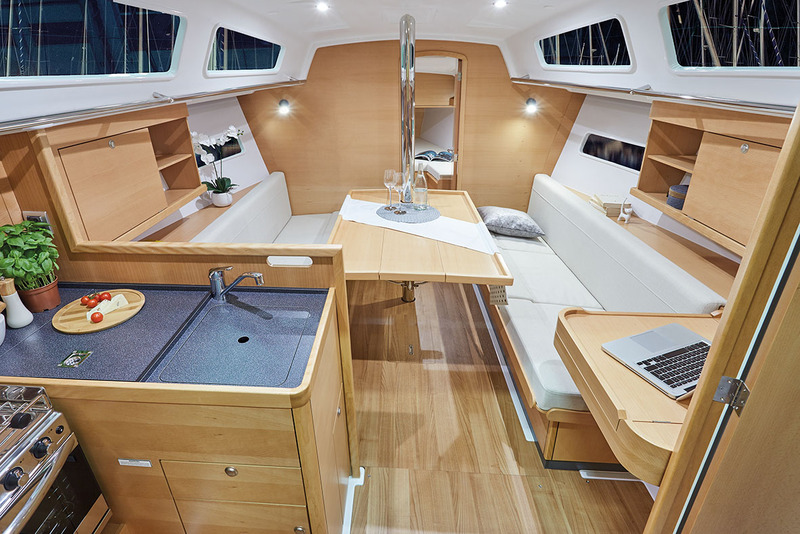 The space-saving solution for the hatch is excellent, because it rests on the companionway, and when you slide it away to go below, both remain under the deckhouse, one above the other. So there is thus no need to store the hatch in a locker that is normally stuffed with all kinds of other things, and when it is needed the whole locker has got to be emptied to get hold of it. 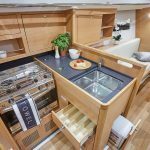 Jeanneau Sun Odyssey 319 may not go like lightning in light winds, but – in its favour – it has some very surprising volumes for a vessel that is classed as a small pleasure boat. Actually it is still less than the limit, because it reaches the fateful 9.99 metres only when all of the dolphin striker is included, while what is actually the hull measures 944 cm. 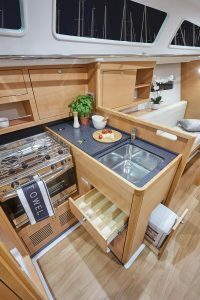 The feeling of comfort below is very striking, given that the headroom almost everywhere exceeds 185 cm, there is a lot of natural light in the dinette and the cabins are large. There are two cabins, one forward and one aft. The forward one has a 140 cm-wide berth, and the stern one is a full 160 cm, with the bed positioned longitudinally and not along the beam. 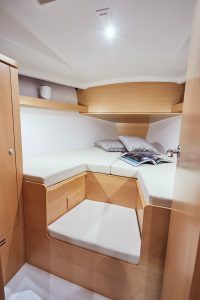 The other advantage of having the berth placed on the fore-aft axis, as well as the width, is that there is a lot of room in the cabin, both at the entrance and above the bed. 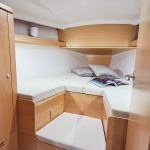 Finally, there are two other single berths, which can be converted from the sofas in the dinette. These two are more than large enough, given that they are 190 cm long and just under 80 cm wide. To finish off the cruise in comfort there are the generously sized bathroom and the large chart table. 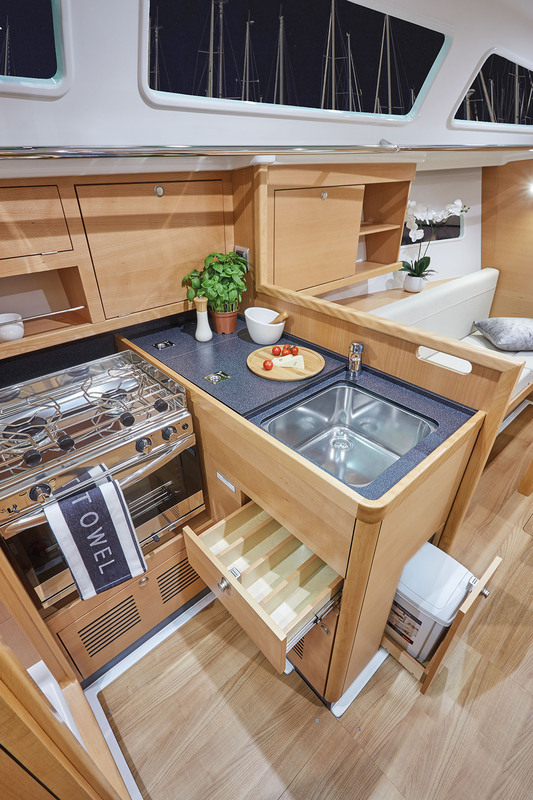 The galley also has a good work surface and a spacious chest fridge. The opening mechanism for the fridge could have been done better, because one of the doors is accessible and works fine, but the other has cabinets above it, and so it isn’t exactly easy to open. Going back into Cannes harbour, we tried out the Jeanneau Sun Odyssey 319 engine. 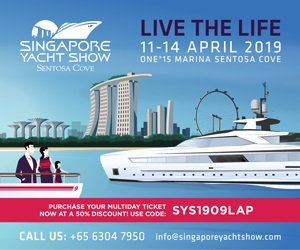 It is a 20 hp Yanmar, which did its job exceptionally well, given that we got a top speed of well over seven knots and when cruising, without forcing the engine too much, we easily clocked up six and a half knots. The wise counsel of a veteran sailor from Grado who was the first person to take me sailing in a cabin cruiser came back to me. When the wind wasn’t especially strong, and we drifted too much when using the sails, he said to me: “Fit the iron genoa, otherwise we won’t get there”. The iron genoa was the engine.